“Give people what they want, when they want it, in the form they want it in…” said Kevin Spacey in a speech at the Edinburgh Television Festival in 2013 about the recent success of his series, House of Cards. Though he was referring to Netflix and the film industry, he just as easily could have been talking about optimizing websites. When you understand the motivations driving your prospects and customers, you can reflect their feelings back to them (in their own words, I might add). That way, you’re way more likely to convince them buying from you is the right call. So, how do you figure out that all important why? And, what’s the best way to capitalize on it when you do? That’s where tapping into the power of your Voice of Customer Research comes in. Follow along as I walk you step by step through the process. You’ll learn how to pull out the key messages from your prospects and customers and use them to boost conversions. Later, I’ll show you a real life example from the trenches. What is Voice of Customer Research? Voice of Customer (VOC) refers to the process of discovering the wants and needs of customers through qualitative and quantitative research. Initially created as a way to link customer needs to performance measures in Japanese product development, VOC has jumped into the mainstream of market research. In a landmark paper by Griffin and Hauser in Marketing Science (1993), they defined four aspects to take into consideration when conducting voice of customer research. Refer to John Hauser’s Note on the Voice of the Customer to get a detailed elaboration on each aspect. For the purposes of this post, I’ll be discussing voice of customer research in terms of employing customer (and prospect) feedback about a product or service to develop more persuasive copy specifically. There are loads of methods for pulling together Voice of Customer Data. From interviews to surveys and forums to onsite reviews, you can pick out the recurring messages and verbiage that most resonates with your prospects and customers then identify their order of importance. One of the most reliable and easy to tackle ways of getting highly usable bits of customer insights (and what I’ll cover in this post) is through surveys. Whether you use onsite pop up surveys or ones you email to your subscriber list, the key is to ask the questions that will get you the answers you need to optimize your copy and site. Sounds pretty simple? Yes and no. While it’s not rocket science, the process takes some time, thought, and organization. Your first step involves compiling the research. As Avinash Kaushik of Google writes, “…for the fastest way to understanding customer problems there is nothing like asking the customer herself/himself.” The challenge is knowing the best questions to ask when and where. There are countless questions you can ask your prospects and customers. However, the best way to narrow the options down is by knowing what your end goal is. What pages on your site are you looking to optimize with your copy and what do you need to learn in order to do that most effectively? For instance, if you’ve discovered from your analytics that you’re losing a high percentage of people on your checkout page you may want to ask those visitors who have completed a purchase a single question before leaving your site. 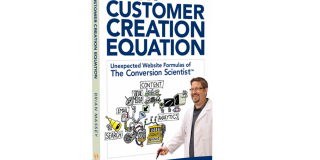 Or, you may be tasked with reworking an entire home page and corresponding sales funnel. In that case, sending out a survey by email to both your prospects and recent customers asking them a series of questions that gives you the best chance of understanding what they see as the benefits of your solution along with their biggest pain points. “When did you realize you needed a product/service like ours?” – This is a question that will help you find out what the trigger events are going on in a person’s life that motivate him to seek out your solution. “What problem does our product/service lessen or fix for you?”- Here you’ll be able to find out what your customers consider the problem to be. You may find there are problems you’re solving that you didn’t know about. “Did you consider any alternatives to buying/working from/with us?” – It’s always a good idea to know who your customers see as your competition. This will help you build a case as to why they should buy from you. 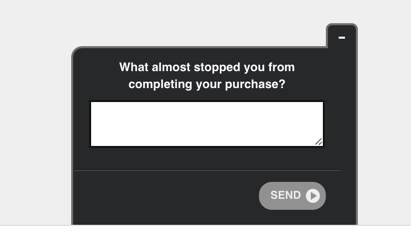 “What concerns or hesitations did you have before you decided to buy/work with us?” – Being able to address any sources of friction in your copy is incredibly important. You can reflect your customers’ concerns back to them in terms of how you or your business will alleviate them. Check out Peep’s post on How to Identify Your Online Target Audience and Sell More for his list of questions along with survey tips and Everything You Need To Know About Designing Valuable Customer Surveys from the blog. Now that you’ve asked your questions and gotten your answers, it’s time to pull out phrases and sentences written by your respondents that will give you the best insights into developing your copy. You can either download the document I created (instructions below), or simply open up your own Google document and start copying and pasting any responses that fit into each category. Place an asterisk next to anything you pull out that seems particularly well said. To download the template, share the article using one of the buttons below. Once you have access, just click File > Make a Copy, then you’ll have one to keep. At this point if you’re wondering how important taking out the actual words your prospects and customers are using, think again. Joanna Wiebe of CopyHackers who trained me in conversion copywriting and has taught this uber helpful technique of message mining to countless others, A/B tested a headline for a rehab center in which she swiped the copy directly from a book review on addiction. While not taken from a survey response, the premise was the same: find out what your ideal target audience needs to hear and the language those people need to hear it in to trip their triggers. 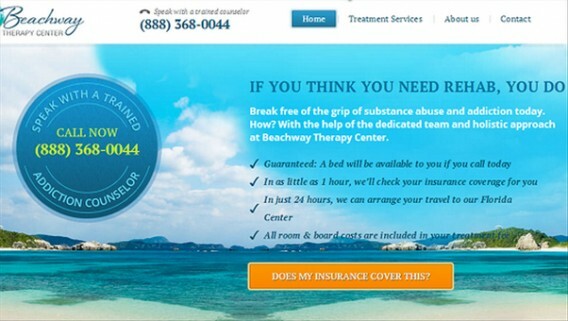 Joanna tested the control headline, “Your addiction ends here,” with the headline “If you think you need rehab, you do.” The new headline generated >400% more clicks on the main call to action button and >20% more lead generation form submissions on the next page. If you don’t have a pool of customers or prospects to survey, check out my post How to Write Compelling Copy When You Don’t Have an Audience on ConversionXL. It’s the companion piece to this one. Start analyzing all the voice of customer data you pulled out from your survey responses by going back through each column and making note of the recurring themes. Chances are you’ll start to find a pattern. Let’s say you’re finding over and over again under your Hesitations/Anxieties column that respondents almost didn’t purchase your product because they couldn’t see how it would positively impact their business. Keep a tally going for your columns. Then, grab the top 3 or 4 messages from each and either drop them into a new document or grab this Google doc I created. available for download. To find the gaps in your existing copy, it’s time to compare what’s on the page with what your visitors are saying. How is your product/solution solving your customers’ problems? What are the benefits of your product/solution? Compare your copy to what you’ve mined. If the majority of your prospects and/or customers tell you that they can’t live without your app because of it’s great interface, reliability, and easy integration with your software and all you’re talking about is price… you’ve created a communication gap. And… gaps lead to big wide holes in conversions. It’s all well and good to have a process spelled out for you, but it’s even better when you’ve got an example to see how someone else has put the pieces together. 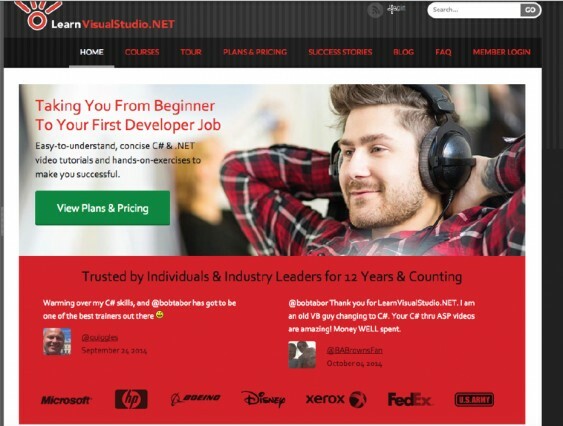 So, let’s look at how my colleague Dustin Drees – CRO pro – and I set about using voice of customer research to optimize the LearnVisualStudio.NET home page. 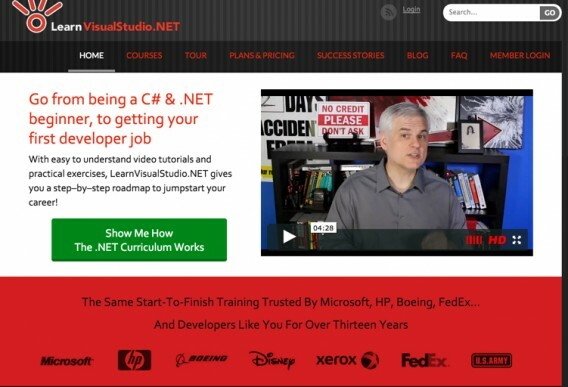 LearnVisualStudio.NET (LVS) is a subscription model business where people can sign up for a yearly or lifetime membership to gain access to videos teaching the .NET programming language. In addition, 69.74% of those who responded to the second question (119 responses), said they were Most interested in finding their first developer job. He took that information to run a simple copy test to determine if there was in fact a disconnect between the value proposition presented on the home page and LVS’s target audience. The goal was to increase site engagement – moving more of the right people further into the site. Simply by telling visitors who these lessons are specifically designed for and the end result of taking them, conversions increased on the Courses (+9.2%), Plans and Pricing (+24%), and Curriculum (+23.9%) after three weeks and reaching statistical significance. I was tasked with going through the second survey to see where the copy might be missing the mark. Before coming to any conclusions, I went about the same process outlined in the 3 step process above. 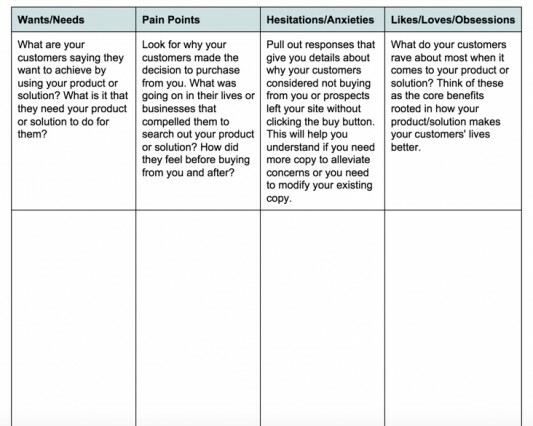 I copied and pasted relevant pieces of survey responses under each category, ranked them, and then created a hierarchy of needs, wants, and friction points. What we realized after teasing apart the voice of customer data was twofold: visitors were having a difficult time understanding how much value the courses could provide and encountering friction by not having their primary concerns addressed. With the copy below the fold, we did this in two different ways. First, we framed their anxieties in the form of solutions the courses could provide for them. Then, we reiterated the top 3 benefits uncovered in the survey responses and rounded them out with additional copy making sure to include some of the most heavily used words straight from the customers’ mouths. Instead of continuing to send visitors straight to the Plans and Pricing page, we directed them to the Curriculum page where they could get a better idea of what was included in the courses. One of the biggest sources of friction for visitors was being unsure if joining LVS would fit their needs. One of the biggest selling points of the program is the founder of LVS and teacher of all the video courses, Bob Tabor. The most recent customer survey showed overwhelmingly that people were drawn to Bob’s style and personality in his videos. So, our aim was to get him seen as soon as people landed on the home page. 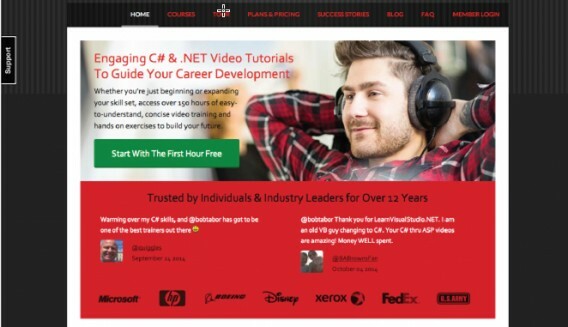 Since video can be highly persuasive and effective at increasing conversions, we had Bob talk about his courses within the context of what’s in it for potential students while addressing the biggest concerns found in our research. Our variation outperformed the original on the main call to action button above the fold by 66.3%. Significantly more people were choosing to check out the Curriculum page over the Plans and Pricing page. In fact, we saw a rise in visits to the Curriculum page overall without the call to action traffic factored in – meaning even if visitors chose not to click on the main button they were still more likely to visit that page. No surprise, visits to the Plans and Pricing Page were down by 14.6% on the variation. But… we found something interesting happening. The big takeaway: By taking the time to diligently go through our voice of customer research in tandem with the quantitative, hypothesize based on the data, and test, we discovered the journey customers need to take on the site in order to make a buying decision. Now we have a better idea going into optimizing the rest of that journey. Start communicating with your customers and gathering your own voice of customer research. Sure, it takes some work but there’s the potential for a big payoff in learnings and conversions. … And you might just find that once you know what your customers want, when they want it, and the form they want it in, the copy will write itself. Your article was a great read Jen! Thanks a lot. I’ve actually thought about asking my blog’s visitors directly what their thoughts are regarding the content I publish and to that extent, I tried out Qualaroo before. It worked out actually and I got the data that I needed. However, for around USD60/month, I knew that I wasn’t going to be able to keep up with the payments in the long run. So I kept looking for suitable alternatives and recently found Qeryz. It also allows you to create targeted online pop-up surveys, much like Qualaroo does, but the big difference is the pricing. You can get a basic plan for as low as USD15/month. This definitely gets me the info I need without breaking the bank. I recommend for you to try it out. So glad it was helpful! Try out WebEngage. I think they have a free version. Cool! Looks awesome Jen. I’ll check this one out as well. Thanks. Thanks so much for this. These are some really helpful tips in how to match your copy to your target audience – and using the text from your survey results seems like a brilliant idea! I haven’t thought about that until now but it is a great way to emotionally target the audience! Happy that you found this helpful. I wrote another post on ConversionXL about personas. You might want to check that one out as well. Tools like Qualaroo are fine for very simple qual exercises, but if you’re serious about digging into the “why” it’s much more powerful to have a real dialogue with a subset of your users. Not to put out a shameless plug here, but I’m the founder of a startup called FocusGroupIt (https://www.focusgroupit.com) that lets anyone run a forum-style focus group discussion with their users (it’s free for small groups). People tend to leave short comments in surveys and pop-ups because they don’t know if anyone will ever read it, whereas having a moderated conversation where they know you (and others) are actually listening gets to the “real” voice of the customer. Thanks for sharing your tool. I’ll definitely check it out. I’m always interested in finding out about ways to better connect with customers.